This beautiful abode belongs to a very lucky three-year-old, Eliora. 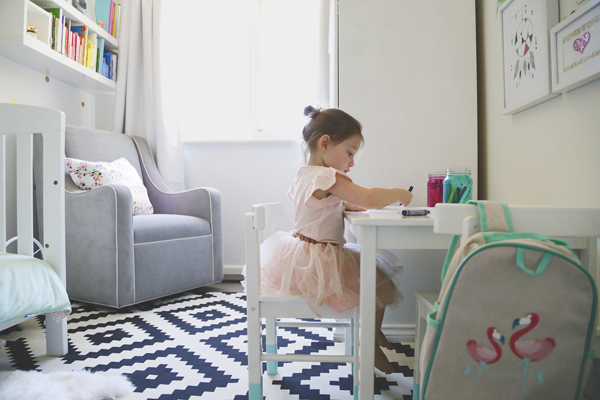 Her mum Deborah had a pretty simple plan in mind when building this bedroom – to create a fun-loving space in which her daughter could sleep, play and grow. Add lots of natural light to the mix and the results speak for themselves. To allow Eliora space to grow with the room, Deborah (who I’m sure it won’t surprise you to learn is an interior designer) opted for more neutral furniture pieces that perfectly complement the quirky décor accents. I’m particularly loving the sweet sophistication given to the room by the smattering of gold throughout – from the walls, tassels and artwork and everything in between, it hits all the right notes. Starting with a neutral backdrop such as the gold dot wall decals allowed me to add lots of different pops of colour together with the white furniture. I didn’t want the room to be overly girly so I added a graphic black and white Ikea rug which is a great contrast to the other colours in the room. Much of the furniture and decorative pieces are either reinvented from pre-loved pieces or created from scratch by this crafty mum. 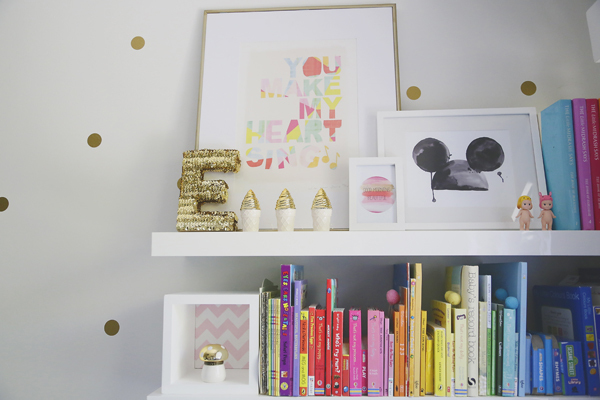 She cleverly constructed the gold sequined letter E for Eliora, paint-dipped the feet on the little white chairs as well as painting the turquoise trim on the white Ikea dresser. Even the timeless smoky grey nursing chair is Deborah’s very own design. 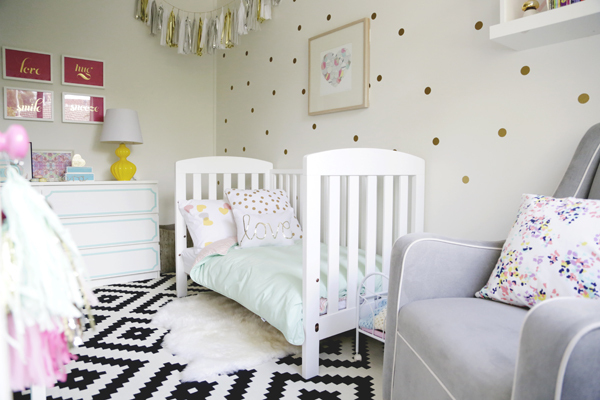 The end result is a room where all pieces mesh together happily to ensure Eliora is sitting pretty for years to come. 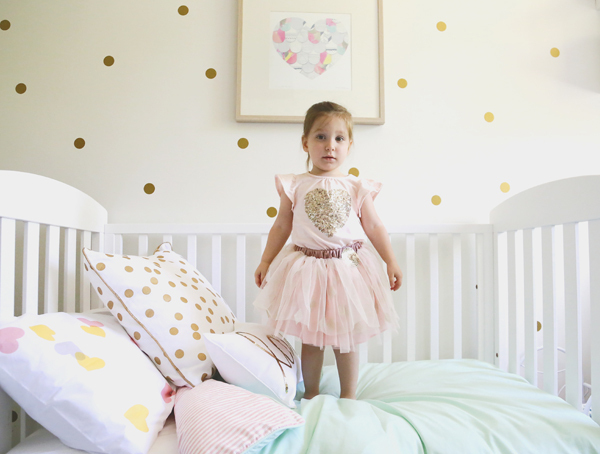 It took around six months to complete as I had a lot more DIY projects than I ever imagined but it allowed for a more personal space that Eliora loves and tells every person that sees the room, “my mum made it for me!” . 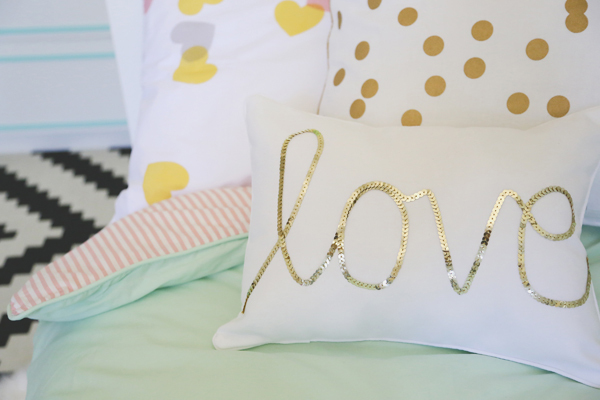 With all the lovely affirmations that are sprinkled throughout the room, this sweet little sanctuary is certainly a labour of lots and lots of love!